Met up with Jeen for our weekly get together. 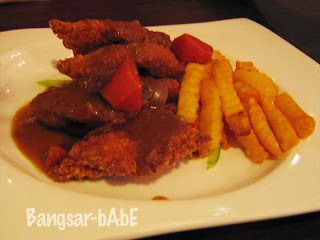 I didn’t feel like going too far for food so we had dinner at Decanter, Damansara Heights. Jeen had the Hainanese Chicken Chop while I went for the Cantonese Kuay Teow. Our food didn’t take too long to arrive…I think we only waited for 15-20 mins. My Cantonese Kuay Teow was quite good. It wasn’t cheap but considering the portion, it was a pretty good deal. Silky smooth rice noodles slightly charred with “wok hei” flavour and covered in delicious gravy, it was salty enough to my liking. I counted 6 medium-sized prawns, plenty of squid and chicken. Jeen’s chicken arrived shortly after mine. Topped with very little gravy, it was dry and lacked flavour. The chicken was breaded and deep fried unlike the original version which is usually coated in batter. 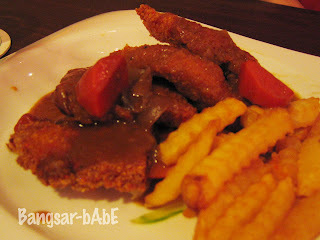 Kluang Station’s chicken chop fared better and it is cheaper too. The fries were quite dark in colour so I assume the chef must have fried them with the same oil he used to fry the chicken. We had scones for dessert. 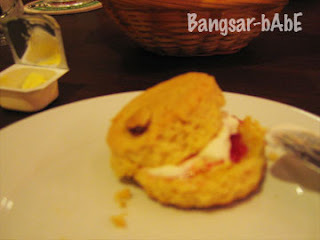 The scones were OK. Light and crumbly in texture, we had them with butter, cream and strawberry jam. 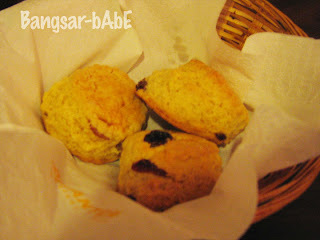 If I hadn’t studied in UK and had awesome scones there, I would have thought these were delicious. Service was satisfactory that day as there were not many patrons around. Not sure how they will fare when there are more people. Our bill came up to RM 34.50 inclusive of tax and service charge. Verdict: Cosy and quiet, it’s the ideal place for a quiet meal. I wouldn’t mind coming here on a regular basis…that’s if they maintain their good service. Eh.. If you said that RM5 for 5 pieces, what happen to the other 2 pieces in the photo? I only see 3 pieces there. Was somebody so greedy to eat it till she forgot to take the photo? IyooOooOo.. Dont blame people for your own doing.. I bet you took the first scone then only she followed suit.. I like the peach and banana crumble with custard at Decanter. It’s the perfect comfort food. Sounds like comfort food indeed…Thanks for the tip!